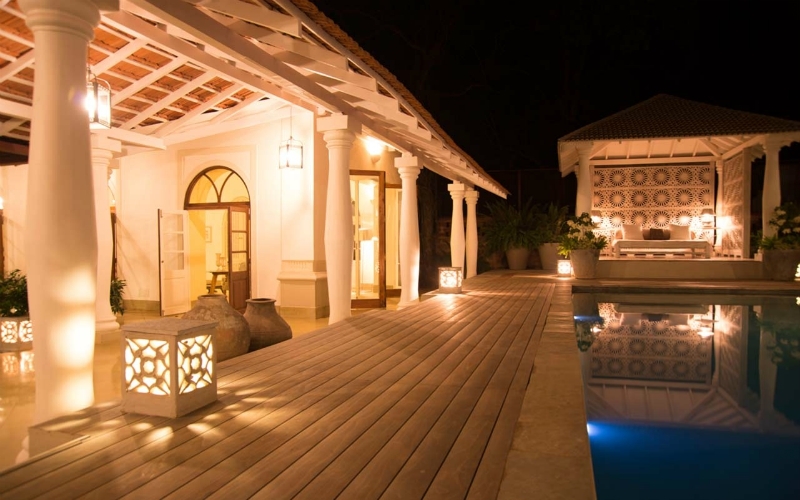 It’s a widely acknowledged fact that almost any time spent in Goa is time well spent. Though there is a certain charm to the grungy backpacker hostels or beachfront shacks, it’s a charm that quickly fades if you plan to stay there long term. 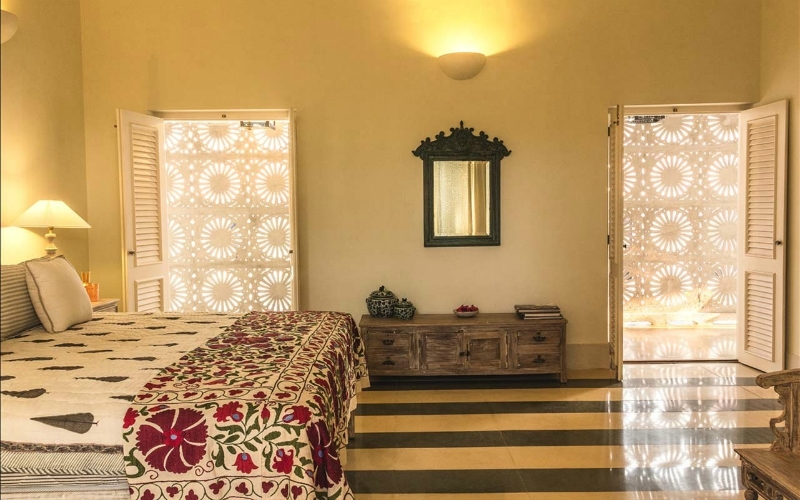 And if you do plan to be a regular in the holiday state, it can be well worth investing in a holiday home that will allow you to appreciate Goa’s inimitable atmosphere in luxurious comfort. This is exactly the thought Gurmeet Akali and Benjamin Robb of Studio Momo had when creating the stunning Villa Branco in Anjuna. Studio Momo is an Architectural and Interior Design firm that specialises in the creation and restoration of luxury Indo-Portuguese villas. They are also dedicated to environmental consciousness and implement elements of sustainable design into every stage of their process. 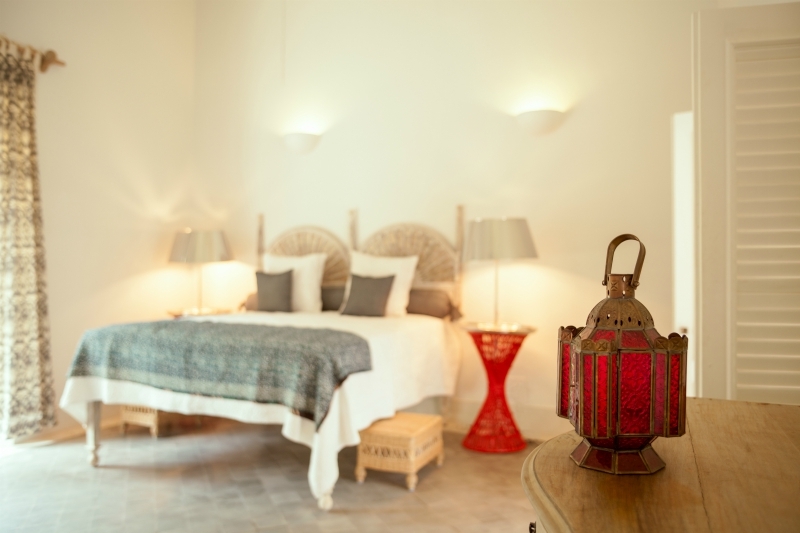 When they started work on Villa Branco the aim was to create a holiday home that fused simplicity with elegance. 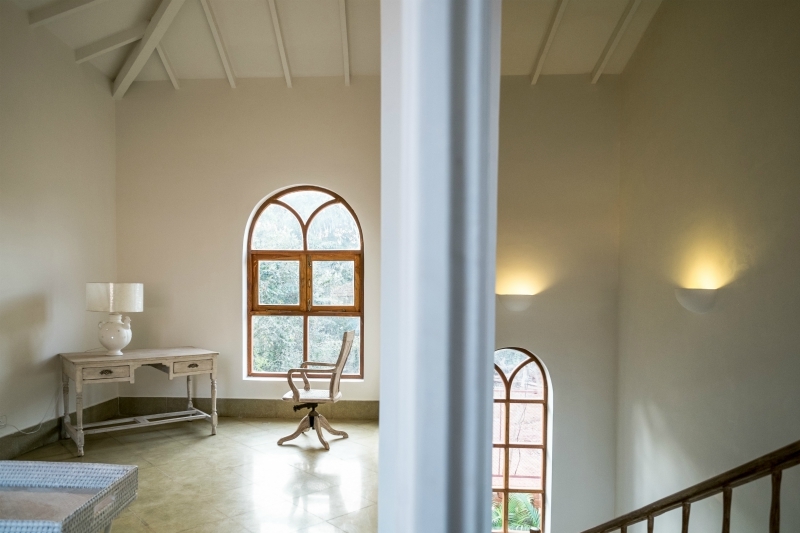 One of the most notable aspects of Studio Momo’s design is the integration of Japanese Wabi-Sabi concepts throughout the villa. ‘Wabi-Sabi is a philosophy that celebrates beauty in imperfection’, that an ‘unfinished’ look can be every bit as enchanting as perceived perfection. In Villa Branco these concepts were translated in the construction itself, they used unique elemental materials like stone, metal and wood whose appearances only improve with age and weathering. One of the best examples of Wabi-Sabi in the house is an antique wood panel in the dining area. “When we found it, it has missing pieces of stained glass. Instead of adding matching new stained glass we uses mirrors which gives the panel a unique character”, explains Gurmeet. These statement pieces combined with the use of a light, earthy colour palette enhance Villa Branco’s harmonious atmosphere. They’re incredibly dedicated to their ethos of sustainability in interior decoration and most of the furniture was either sourced from around the country and upcycled or constructed from local materials. 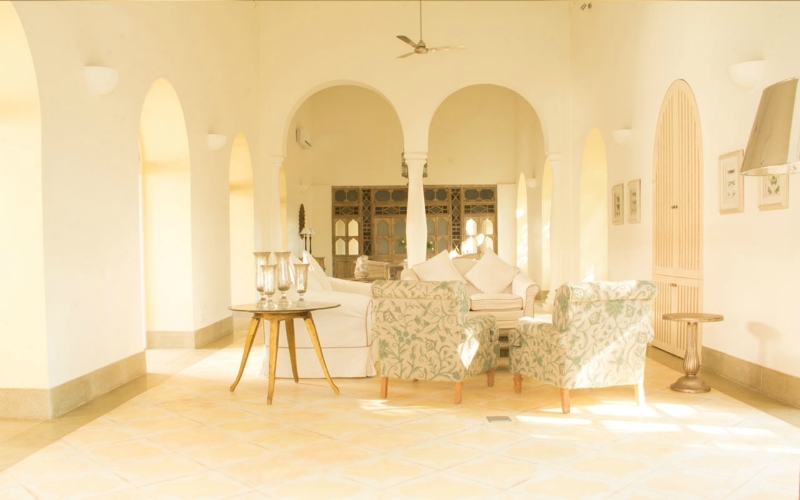 For example, the stone nandi which is one of the focal points upon entering the villa was found in Gujarat and refurbished, the stunning art nouveau windows were rescued from old homes and palaces and the glass paintings in the bedrooms date back to the Mughal era. In addition to this their in-house collaboration with the company, Chalkburn provides organic furniture polish, waxes and paint which are used on all their projects. For Gurmeet and Benjamin, it’s not one singular phase or a project that takes precedence, it’s the careful curation of many elements and the most exciting part is the final juxtaposition of the whole. “From the flooring patterns to the curtains and upholstery it is all bespoke, designed in- house, whereas the furniture and artifacts are handpicked from antique shops. So a lot of the final look depended on what we could find during our sourcing trips.” Says Gurmeet. For Villa Branco, each component has come together seamlessly to create a contemporary, organic space full of light and tranquility that makes for a space that anyone would be proud to call home. harley davidson’s first indian office, by morphogenesis. 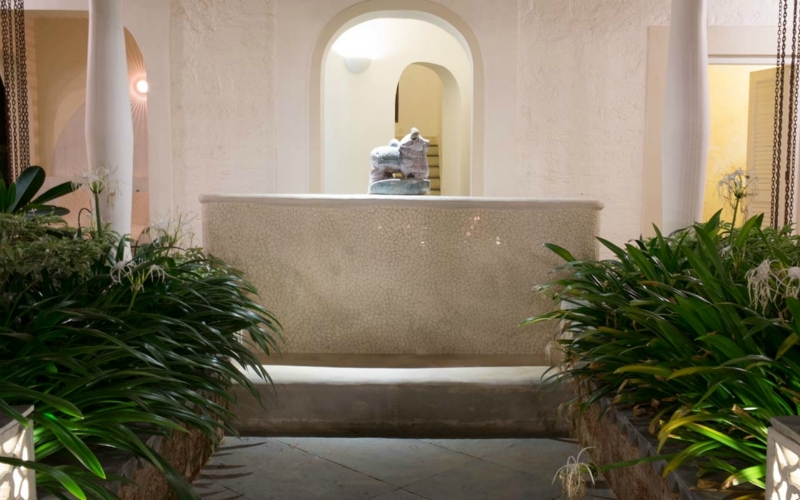 Next articlemateus boutique hotel, goa. restored.